» RRSP MAXIMIZER, Loan Application. » Consumer Identity Theft Checklist. » Investment Calculator shows the effects of inflation on investments and savings. » Credit Union Advantage. Discover It! 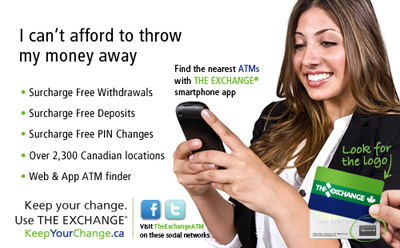 A better rate for your savings! Look at our rate sheet...We have higher rates for you! OECU has proudly been awarding post-secondary scholarships since 2001. We are happy to announce this year will be no different and we look forward to adding to the $133,000 awarded in scholarships to date! Every year we award significant scholarships to many deserving students who are members or relatives of our Credit Union Members. This year’s application submission deadline is April 4, 2019. Details of the scholarship and application packages are linked below or can be obtained by contacting our offices. “Hard sell & up sell” practices in the financial world! The concept of a “Sales Culture” has been around for a very long time. It is not something that our Board of Directors or I have embraced as the business model for our organization. We instead focus on providing exceptional service! It is our desire to have a diverse Board of Directors that is a reflection of our Membership. We are searching for candidates that have a passion to make our Credit Union better today and tomorrow. OECU is pleased to launch “e-tsf” the simple, secure way to transfer money from anywhere to anyone. Are YOU on the DEBT TREADMILL? Are you tired of paying a debt that NEVER gets paid? The rates you are paying are probably TOO HIGH! LET US SAVE YOU 60%! That’s the average percentage interest cost we save credit union members and their families when they consolidate their debt with us. Start Saving Today… click here for details. If your ATM (Membercard) is Lost, Stolen, Compromised (skimmed) or even if you just have a sense that your card may have been compromised call one of the numbers below and cancel your card immediately. This interactive voice response service is available 24 hours a day seven days a week. ü Birth date and social insurance number. ü Account number and social insurance number. ü Name and social insurance number. ü Name and account number. Who can do business with OECU? All educational employees (current or retired) and their families throughout Ontario can do business with us – Your Full Service Financial Institution. We are the financial institution dedicated to, and specializing in serving the unique needs of the educational community. Read about this and other FAQ's of OECU in the Spring Newsletter. OECU has a new, Mobile web site. We're excited to offer Members access to many of the features of our main site on a handheld device. Features that are currently available on our Mobile site, include: NetBanking, ATM Locator, Promos, News, Services, Rates and a Contact page with office maps. 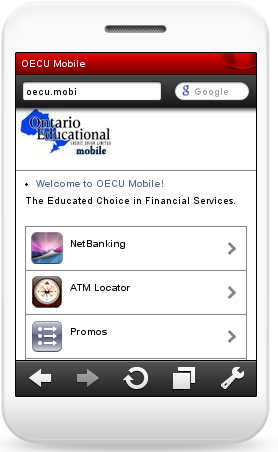 To access the OECU mobile web site, enter oecu.mobi into the web address bar on your smart phone or mobile device. Note: Visiting the OECU mobile web site (oecu.mobi) on a computer will automatically re-direct you to our main web site (oecu.on.ca). and much more! “Go Figure”.